BD is currently running a promotion for item number: 1276358. 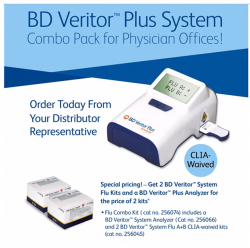 When you purchase this item you will receive 1 analyzer and 2 boxes of Flu Cassettes (for the price of 2 boxes of Flu Cassettes 9920002). If you are interested in this promotion please contact us at: THSCS@texashealth.org and we will connect you to our BD Contact for more information.